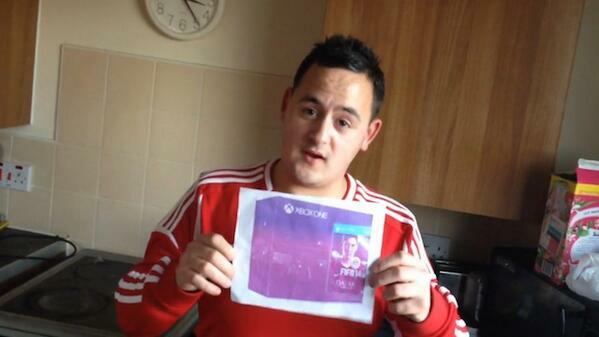 Peter Clatworthy (pictured) from Nottingham, UK was eagerly expecting a large package to arrive at his house the day after he purchased a $750 Xbox One console including FIFA 14. However, the 19 year old was not expecting a small envelope to be the $750 console he had hoped for. Clatworthy, an avid gamer, said he saved up for the limited edition Xbox One as a Christmas present for his young son however was left with a ripped A4 printed image of the $750 console. The eBay listing stated that it was for a photo of the Xbox One, not the console itself. This however did not prevent Clatworthy from purchasing the image due to it being listed under the 'Video games & consoles' category on eBay. After recent public attention, Clatworthy stated that the title of the auction was 'misleading' and 'unfair', this has since caught eBay's attention who claim that he will receive a full refund, "We don't allow listings which mislead, and we will take action against the seller" claim the online giants. Since this bizarre case, Clatworthy has framed the image in his living room to remind him of the day he brought the cheapest and lightest Xbox One in the world.